Glenn Irwin on the PBM Be Wiser Ducati during practice at Thruxton on Friday. Glenn Irwin is seeking further improvement this weekend at Thruxton as the MCE British Superbike rider continues his recovery from injury. 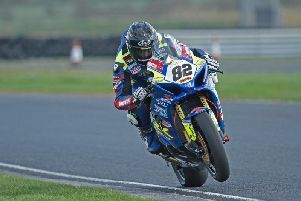 The Carrick man sustained serious shoulder and elbow damage in a crash at Knockhill last month, which ruled him out of the Scottish round of the series and the following meeting at Snetterton. Irwin had been holding fifth place in the championship prior to his crash in free practice at Knockhill, but the 28-year-old PBM Be Wiser Ducati rider slipped down the order after missing four races on the spin. Although still struggling with his injuries, Irwin made his comeback at Brands Hatch Indy a fortnight ago, finishing 16th in race one before scoring points in 14th position in the second race. The Ulster rider is only seven weeks into an expected 12-week recovery period, but Irwin showed signs that he is feeling more comfortable on the Panigale R as he ended the second free practice session 11th fastest on Friday, one second behind early pacesetter Jake Dixon on the RAF Reserves Kawasaki. “My crew are working harder to make the bike behave how I want it – my shoulder feels better than Brands,” said Irwin, who is feeling extra motivated after watching his brother Graeme secure the British MX1 title last weekend. Fellow Northern Ireland rider Andy Reid was 21st fastest on the Tyco BMW as he continues his learning curve in the Superbike class after replacing Davide Giugliano in the Moneymore team. Brands double winner Shane ‘Shakey’ Byrne (Be Wiser Ducati) was fourth quickest behind Dixon, Josh Brookes (Anvil Hire TAG Racing Yamaha) and Smiths BMW rider Peter Hickman, as only 0.245s covered the top four at the Hampshire track. Byrne has won the last four races in succession to open a gap of 29 points in the standings over JG Speedfit Kawasaki’s Luke Mossey, who was fifth fastest in FP2. Michael Dunlop is also in action at Thruxton on the Bennetts Suzuki as the Ballymoney man gets in some track time on the GSX-R1000 ahead of next week’s MCE Ulster Grand Prix, where BSB frontrunner Hickman is among his chief rivals. Qualifying and Superpole takes place on Saturday from 4pm, with race one scheduled for 1.30pm on Sunday followed by the second race at 4.30pm. Meanwhile, Jack Kennedy topped the free practice times in the Dickies British Supersport class on the Tempus MV Agusta. The Dubliner, who won race two at Brands from Keith Farmer and Andrew Irwin in a thrilling finish, was 0.062s ahead of Joe Francis on the Halsall Yamaha, while Irwin was the leading Northern Ireland rider in fourth on the Gearlink Kawasaki behind EHA Racing’s Ross Twyman. Carrick rider Irwin has been agonisingly close to his maiden Supersport triumph this season and it is surely only a matter of time before the young prospect scales the top step of the podium. Championship leader Farmer was seventh fastest on the Macadam Yamaha behind Alastair Seeley (Spirit Moto2), while Eglinton’s David Allingham (EHA Racing) was 10th. The Sprint race is scheduled for a 5.20pm start on Saturday evening over 12 laps, with the Feature race on Sunday at 3.40pm (18 laps).